E-scrap recycling in Singapore is set to get a boost with the launch of a new research centre. Nanyang Technological University has invested nearly $15 million in the new centre, with the creation of a ‘recycling laboratory’. The establishment of the laboratory, above all, will provide the impetus necessary to kick-start proper waste treatment of batteries and printed circuit boards. Singapore generates about 60,000 tonnes of used electronics every year. Similarly, this is the equivalent to the weight of 220 Airbus A3870 airplanes. Finally, in order to ensure high standard recycling NTU joined forces with the French Alternative Energies and Atomic Commission. The new research facility will attempt to recover 75% by weight of valuable materials. Valuable materials like lithium, cobalt and manganese can be extracted from lithium-ion batteries. Singapore are currently only recycling 5% of these materials. Whilst an ambitious target, engineers at NTU have developed a special shredder to crush the batteries in an oxygen-free environment, thereby preventing the batteries from burning up. Following the application of a chemical solution the final process is precipitation in a hydrometallurgical process. Two other opportunities for recycling from the lab include, firstly recycling of silicon from solar panels. Secondly the plastics used in printers and monitors. With the latter the research lab is investigating putting the recycled plastic through an advanced process. This involves heating it using microwaves, and breaking it down into a fuel. The Singapore government will introduce laws on mandatory nationwide e-scrap management by 2021. 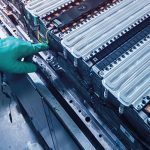 Recycal and its sister companies have announced that two new divisions are being set up to in the second half of 2019 that will recycle batteries and e-waste. These investments will bring to Australia new world-class technology, from Europe. The European laws in relation to recycling are stringent, in contrast to Australia, where government regulation is not as high.